Happy International Lego Classicism Day to all our friends and colleagues! In celebration this year, I have been working on something special: a re-imagining of the cover art from John Chadwick’s The Mycenaean World book, in a 3D Lego model. Far from a just-for-fun exercise, this actually has some helpful practical applications in making us question what Mycenaean scribes did at work, and how Linear B archives functioned. My research has taken a fun turn towards practical experiments lately, as some of our Twitter followers may have noticed. It isn’t just because I wanted to get away from the computer (though I did…); it’s because I have been working on a problem where direct evidence is scarce and/or difficult to interpret, and where experimentation is surprisingly elucidating. My work on a replica Cypro-Minoan tablet. We are pleased to announce the second CREWS conference, to take place in March 2019. ‘Exploring the Social and Cultural Contexts of Historic Writing Systems’ aims to look at writing systems’ place in society and culture. Full details, including the call for papers, are available on the conference page. Today is International Museum Day, a good day to celebrate the stellar work done by museum staff to make museums the places of learning and inspiration that we all know and love. It has been a real privilege to witness this in action through our special writing-themed display at the Fitzwilliam Museum in Cambridge (a collaboration between the CREWS project and the Fitzwilliam and British Museums). Our series of blog posts on objects in our special writing-themed display at the Fitzwilliam Museum is drawing to an end, with just three objects left. This week the spotlight is on a replica clay tablet inscribed in Linear A, which I made as part of a practical writing experiment. Did you know that between the 8th and 5th/4th centuries BC, there was more than one alphabet used in ancient Greece? Each region had its own alphabet – all similar to each other but with a few distinctive features (e.g. extra letters, or a special value for a letter that had a different value elsewhere). 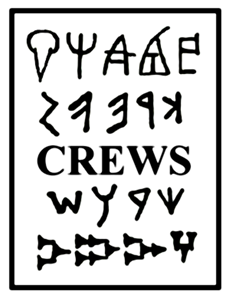 In this post I want to talk about the island of Crete, which was one of the areas that had its own unique alphabet. We recently had the pleasure of being involved in a number of outreach events organised through the Cambridge Festival of Ideas. That meant talking to the public about our work and showing people (especially groups of children) how to write in ancient writing systems. These are more than ‘just’ outreach events for us – they are a valuable opportunity to put our theoretical work into practice and share it with others! You don’t have to be present at these events to join in! If trying your hand at ancient writing appeals to you, have a look at our ‘write your name’ sheets HERE. Currently available are the ‘standard’ Greek alphabet, the Cretan alphabet, Phoenician, Ugaritic cuneiform, Linear B and Egyptian hieroglyphics. They can be downloaded and used for free so please do have a look and try writing your name or a message. First up was the Prehistory and Archaeology Day organised by the McDonald Institute in Cambridge. This was a big event with all sorts of different activities, where the opportunity to learn an ancient writing system was just one of the possibilities on offer. Philip helped to run a drop-in stall (alongside colleagues from Archaeology and Classics) showing people how to write in Ugaritic and Akkadian cuneiform as well as other scripts. The practical element to this was not only learning to write in these scripts but also using a stylus to write something on a clay tablet.